The level of wound complications and quality of reductions in distal tibia fractures remain an issue despite advances in soft-tissue management (staged treatment) and reduction techniques . 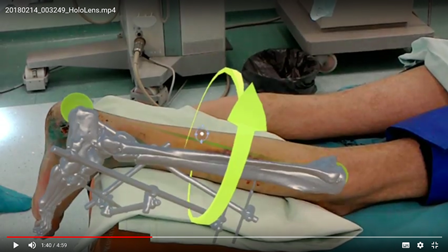 Correct placement of surgical incision(s) centered directly over the fracture line is important to minimize additional insult to vulnerable soft tissues in the region  Augmented reality (AR) technology allows the placement of a holographic image of the fractured bone "within" the leg of the patient, and in this way may promote correct planning of surgical approach(es) and fixation. To evaluate the efficacy of AR technology in the pre-operative planning and surgical treatment of patients with complex distal tibia fractures. In this randomized prospective study we included 24 patients with complex distal tibia fractures (43C according to AO/OTA classification) , treated in our institution from January to September 2017. 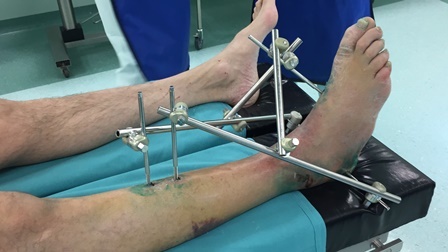 Standard treatment (10 patients) consisted in the initial application of an external fixator (delta-frame) with subsequent definitive fracture reduction and fixation after resolution of soft-tissue swelling (av. 10.6 days after the injury). Planning of definitive fixation was performed according to CT-data, obtained after the ExFix application . The CT-data of 14 patients (AR-group) that underwent the same initial treatment in external fixator were additionally analyzed with the help of Microsoft HololensTM (VOKA® application, Innowise-group, Belarus). VOKA application builds the 3D model of the fractured bone on the base of voxel rendering of CT-data and also provides tools for final tuning and manipulation of the bone model. 3D models are saved in .fbx format and become available for the use in Microsoft HololensTM. 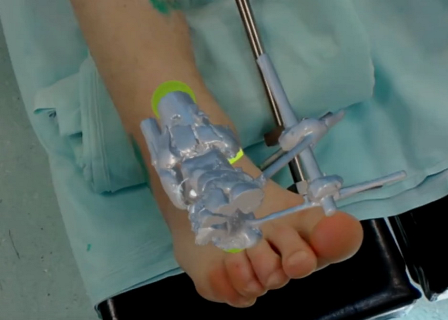 The holographic models of given fractures were initially analyzed more thoroughly with the use of the device and then placed "within" the limb of the patients for definitive planning and marking the surgical approach(es) immediately in the operating room. Mean time to definitive surgery was 11.2 days after the injury. The correct placement of the model within the leg was controlled visually with the use of standard anatomical landmarks (tibia tuberosity, tibia crest, tip of external malleolus, internal malleolus, calcaneal tuberosity and toes). Parts of the external fixator served as additional reference points for correct placement of the holographic bone model within the leg in cases that were operated directly in the external fixator frame. For the purposes of this study we additionally checked the correct position of the holographic fracture model within the leg with an image intensifier by placing the non-radiolucent instrument on the same projected anatomical landmarks of the model (tips of external and internal malleoli) and verifying its position in relation to radiologic picture. non-satisfactory: the additional soft-tissue mobilization exceeded 10 mm from the marked skin incision. 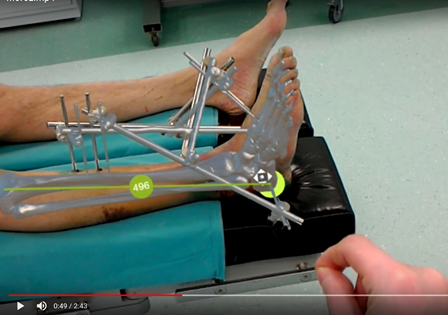 The general length of definitive surgery comprised 118 min in the main group and 124 min in the AR-group due to the time required to place the holographic model in the leg and definitive marking the surgical approach(es) (it took initially around 10-15 min, with some experience the preparation time decreased to 4-6 min). There were not any intraoperative complications in either groups. One superficial wound infection occurred in the AR-group and two in the standard group (non-significant). The quality of reduction was accessed according to the Ovadia and Beals criteria  and was slightly better in the AR-group (78.6% vs. 70% of good reductions, non-significant). The technology of placing the 3D-picture of the given fracture within the limb is very promising. Potential advantages include more precise and accurate placement of surgical incisions. Technology allows also to place images of important anatomical structures (like vessels and nerves) in connection to boney structures. All this will potentially lead to safer surgery, faster post-operative recovery and restoration of limb function. First reports on the use of AR-technology in the field of vascular reconstructive surgery  have already appeared. The main issues include preparation of anatomical 3D-model and correct placement of this holographic model within the limb. This is a preliminary report and the efficacy of the AR-technology use was not confirmed statistically. At the same time we didn’t notice any adverse effects. AR-technology allowed us for better assessment of fracture morphology (that lead to slightly better reduction quality) and improved planning of surgical approaches with respect to the soft-tissue condition. Potentially this technology will lead to the measurable decrease of additional surgical damage to soft-tissues in the fracture site. Krettek C, Bachmann S. Pilon- fractures. Part 1: Diagnostics, treatment strategies and approaches. Chirurg 2015; 86:87-101. Sitnik A, Beletsky A, Schelkun S Intra-articular fractures of the distal tibia: Current concepts of management // EFORT Open Rev. 2017 Aug 11;2(8):352-361. doi: 10.1302/2058-5241.2.150047. Müller ME, Nazarian S, Koch P, Schatzker J. The comprehensive classification of fractures of long bones. New York: Springer-Verlag, 1990. Ovadia DN, Beals RK. Fractures of the tibial Plafond // J Bone Joint Surg Am. 1986;68:543–551. Pratt P., Ives M., Lawton G., Simmons J., Radev N., Spyropoulou L., Amiras D. Through the HoloLens™ looking glass: augmented reality for extremity reconstruction surgery using 3D vascular models with perforating vessels // European Radiology Experimental (2018) 2:2 DOI 10.1186/s41747-017-0033-2. Augmented reality (AR) is a display technique, which allows digital images or pre-operative planning information to be combined with the surgeon’s view of the real world. This technique lets us have so-called “X-ray vision” without using an X-ray machine, so the surgeon can visualize parts of the patient’s anatomy that are not typically exposed during a surgical procedure. AR can increase the surgeon’s view of unexposed bones and other tissues during surgery while using less invasive techniques. These devices also allow to view pre-operatively determined locations of incisions and real-time medical images with proper spatial alignment during surgery. It sounds like a promising opportunity for future Orthopaedics. 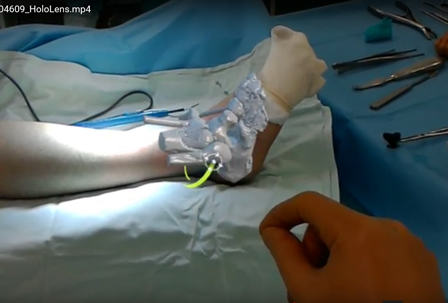 Today we have no exact answer whether it could become a revolution in surgery, but we see more and more studies of AR use, and the results of these studies are not about a computer game for orthopaedic surgeons, but about the improvement of treatment for our patients.